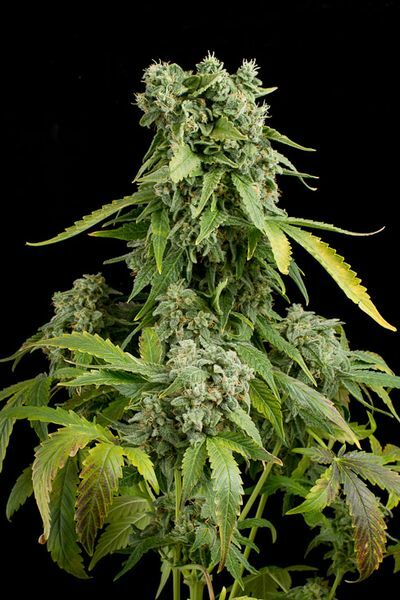 Blue Cheese Auto cannabis seeds by Dinafem Seeds belong to a feminized, autoflowering cannabis strain obtained by crossing a Cheese Auto and a Blueberry Auto. After more than 5 years working on different automatic strains, we have managed to noticeably improve their size, yield, flavour, aroma and effects. Blue Cheese Auto grows into a fast-flowering, high-yielding, easy-to-grow, small, vigorous marijuana plant that produces beautiful, large, compact, heavy buds brimming with resin. It can develop purple hues if it is cold at night, but being a very early harvest outdoors, this will only happen in very cold regions. Blue Cheese Auto cannabis seed is perfectly suited to outdoor cultivation, particularly to stealth growth on the balcony, the terrace or the garden. Ideally, it should be planted between the 15th of May and the 1st of June to make the most of the best light intensity and photoperiod of the year. We recommend that you add 30% of coco to the soil mix in order to improve air circulation and root development, which will result in better plant development. Also, remember that automatic plants enjoy little but frequent watering.